Individual Customer Accounts allow returning customers to retrieve their shipping and billing information, view their order history and quickly re-order a past order. Payment information is not stored. Fill out the fields for the account. At minimum, you will need to fill in an email address, user name and password, set the account group to designate the wholesale level, plus set Active to Yes. 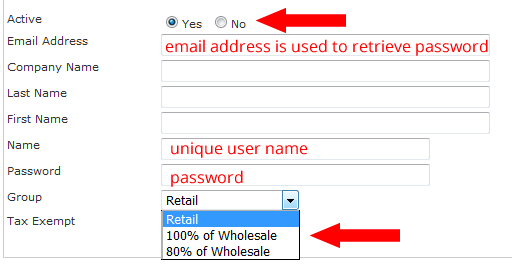 When a wholesale account is created, the default setting on the account are an inactive, wholesale account. You will need to activate the account before the customer can log in. If you prefer to have the default account settings be something other than an inactive wholesale account, contact HEROweb. Account groups are used to assign wholesale discount levels to an account. Depending on the needs of your site, you may have one, or multiple, discount levels. When a wholesale customer is logged into his or her account, the prices displayed will be the wholesale price associated with that account group.